This Thursday! 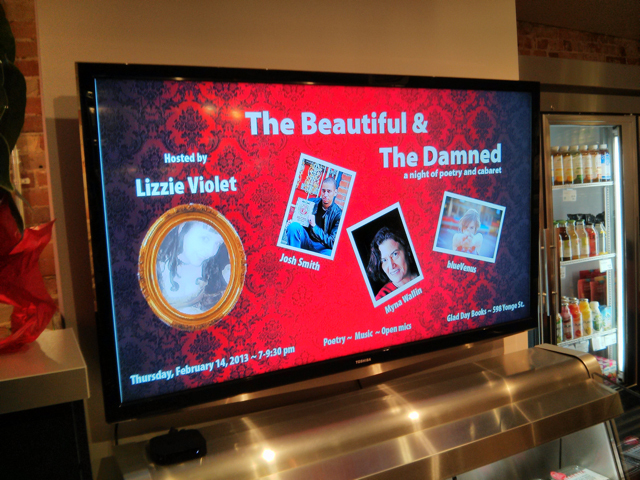 The Beautiful & The Damned and I’m Hosting! Hosted by your very own Femme Fatale Lizzie Violet, our February edition is dedicated to Femme Fatales. How fitting for Valentine’s Day! 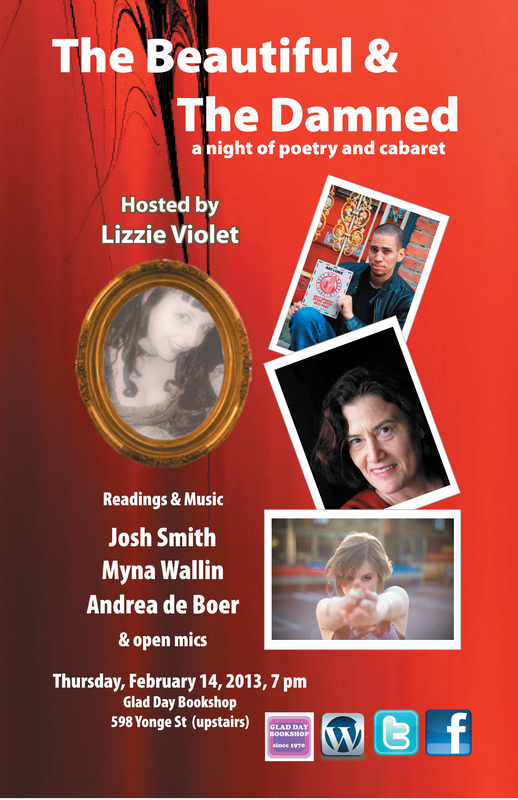 The Beautiful and the Damned is a Poetry Cabaret every second Thursday of the month at Glad Day Bookstore on Yonge Street (upstairs)). Josh Smith – The brain is the sexiest muscle, and Josh Smith is Buffalo, New York’s weapon of mass seduction. From behind the exterior of a black-belt biker, Smith has exercised his creativity most of all, his work being published by the Buffalo News, Chrysalis Zine and Ploughshares. He’s featured across the northeast, including some of Toronto’s most prized stages. In 2012 he captured the Best of Buffalo award for Best Poet, and in 2013, joined the hosting team of the Art Bar Poetry Series. Myna is currently working on a second poetry manuscript tentatively titled, Death, Wildlife and Taxes. She met her boyfriend last Valentine’s Eve, 2013, so apologizes if one or two squishy sentiments find their way into her usually cynical, anti-romantic writing. polished but highly textured mélange of sounds. Described as “hypnotic and impressive” by the Frankfurter Allgemeine Zeitung (FAZ) Germany’s national newspaper, de Boer’s voice is a blend of a sultry, bluesy Janis Joplin with the youthful wariness of Fiona Apple. Partnering with Juno Award-winners L. Stu Young to work on their 2004’s self- titled EP, and Matt DeMatteo to produce their first full-length, Grin, released in the fall of 2009, blueVenus has captured the attention of Canada’s most respected producers. With a unique blend of Indie Pop/Rock with Jazz and Latin influences, blueVenus has received many prominent acknowledgments, such as nominations at the Toronto Independent Music Awards and an honourable mention in the 2005 Billboard Song Contest. Appearances include touring Germany and appearing at Turkey’s Rocklstanbul Festival along with Garbage and Megadeth and performing at Canadian and US festivals, like Midpoint Music Festival, NXNE, CMW, Indie Week and NMW-New Music West. For more information please email lizzieviolet13@gmail.com. One of the posters I created can be seen on the big screen TV at Fuel +. It’s a popular coffee shop at 471 Church Street.